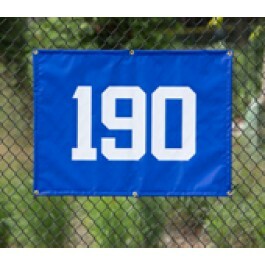 This 27" x 36" outfield distance banner marks your fence with the distance. Our banners are digitally printed and available in a variety of colors. Our outfield distance markers are printed digitally on 13 oz. reinforced vinyl fabric. Available in 14 colors! Please specify desired printed distance (up to 3 digits) and colors. If you are looking to match your school's colors exactly, please contact us for a quote!